OK, I “borrowed” the title of this post. 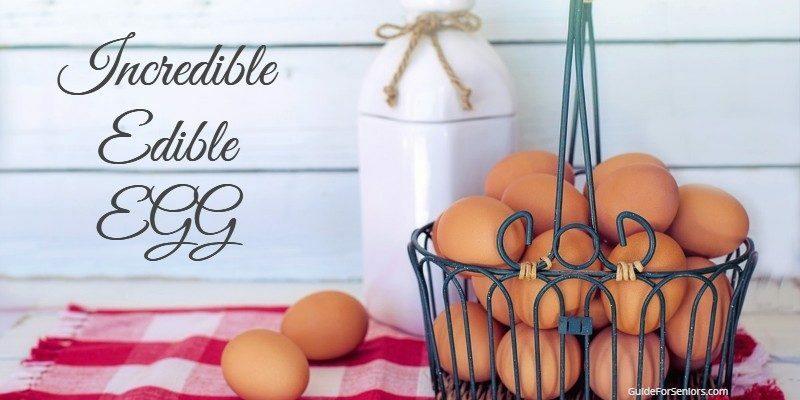 I remember seeing advertisements calling the egg incredible. They were right! An egg contains so many important nutrients. The calories are very little when you consider that those cookies I love so much have 50 calories each and who can eat only one? Hard-boiled, soft-boiled, scrambled-hard, scrambled-soft, omelets, sunny side up, over easy, over medium, over hard, poached, baked, basted, Spanish fried eggs, eggs in a basket. There are even more ways that eggs are used in all of our dishes: in the batter for: cakes, cookies, bread, and piecrusts, as well as for baked scotch eggs, eggs benedict, whipping the whites of eggs, and more. However you use them, they are good for you and taste great. Generally, only chicken eggs or duck eggs are used for the above. The difference is important. Duck egg shells are thicker than chicken eggs so will stay fresh longer. There are more Omega-3 fatty acids in duck eggs that are so good for you. The whites of the duck eggs have more protein than the whites of chicken eggs so they will whip up higher when beaten. Many individuals are allergic to chicken eggs. Often they are not allergic to duck eggs. If that allergy is the problem with cooked pastries and cakes, changing to duck eggs may solve that complication. This is due to the fact that the protein in duck eggs is different than the protein in chicken eggs. A duck egg can be substituted for a chicken egg in most recipes. It is not a good idea to consume raw eggs. First the salmonella problem. It is rare for eggs to have salmonella but some do. The salmonella bacteria is killed if your egg is cooked. That alone makes it a good idea to always cook your eggs. Just one bout with the infection and you would never eat your eggs raw again. It just is not worth the risk to get diarrhea, fever, or abdominal cramps. Especially for 4 to 7 days. I will not eat my eggs raw. Another reason to cook your eggs is that even though raw eggs contain the same nutritional value as cooked eggs, the egg protein is better assimilated by your body when it is heated or cooked. Besides, who could eat a raw egg all by itself? UGH! slimy! Cholesterol is characterized by two types; LDL (low-density lipoproteins, bad cholesterol) and HDL (high-density lipoproteins, good cholesterol). Eggs contain both types of cholesterol. You may be increasing your LDL but at the same time you are increasing your HDL. Per the Mayo clinic : “Effects of egg consumption on blood cholesterol is minimal when considering the effect of trans fats and saturated fats. The final result is that healthy individuals can eat up to 7 eggs per week with no increase in the factors that lead to heart disease.” That is a lot of eggs! Bake eggs for their goodness. Crack eggs before scrambling. Devour Eggs as they taste good. Eat eggs for nutrition. Families love eggs. Great recipes use eggs. Have an egg a day. I love eggs. Jumbo eggs are as good as small eggs. Kindness is preparing eggs with care. Leftovers with eggs are nutritious. My mother cooked delicious eggs. Nutrition is found in a small egg. Open the egg container before leaving the store. Put your eggs in the refrigerator. Quail eggs are not my favorite. Really cook your eggs before consuming. Steak and eggs are a great meal. Try your eggs cooked in a basket. Unique methods can be considered to cook an egg. Very well cooked eggs are delicious. What kind of a day does not start with an egg? Read more ideas for seniors at Guide For Seniors.